Albert Flynn is psyched to return to the Core, the magical world at the center of the earth where Balance Keepers fix problems in three underground Realms. Last term, Albert and his Balance Keeper teammates Birdie and Leroy saved New York by fixing the Calderon Realm and were crowned First Unit, aka the Coolest Kids in the Core. Now Albert and his teammates have been called to the Core for an emergency training session…along with their archenemy, Hoyt. There’s a horrible Imbalance in the Ponderay Realm and they have only seven days before California will be swallowed by hurricanes, earthquakes, and tsunamis. Worse yet, it’s rumored there’s a traitor among them who is causing all this chaos. Will Albert, Leroy, and Birdie discover who’s been putting the Core—and the world above—in danger? Can they save Ponderay before California becomes an underwater wasteland forever? About the Author: Lindsay Cummings is the #1 NYT Bestselling co-author of ZENITH, along with her duology, THE MURDER COMPLEX from Greenwillow Books/HarperCollins, and the MG trilogy THE BALANCE KEEPERS, from Katherine Tegen Books/HarperCollins. She is represented by Pete Knapp at Park Literary in NYC. My Review: This book is way better than the first one!! I loved everything about The Balance Keepers trilogy. I loved each and every one of the characters. I don't even think I could pick a favorite. I love how much the kids have grown in this one. This book had plenty of new things going on. The world build is like never ending since there's another realm. 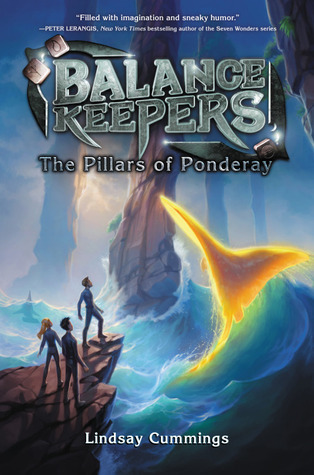 The Pillars of Ponderay is packed with lots of adventure, action, and humor. I just didn't want the book to end and you won't either! Do I Recommend this book? To everyone!